Bitcoin is in a very interesting zone: sitting on a time pivot. Generally, prices respond the same way as the previous time pivot. You’ll read what that means below. Additionally, there is a rare buy opportunity on WAVES/BTC. 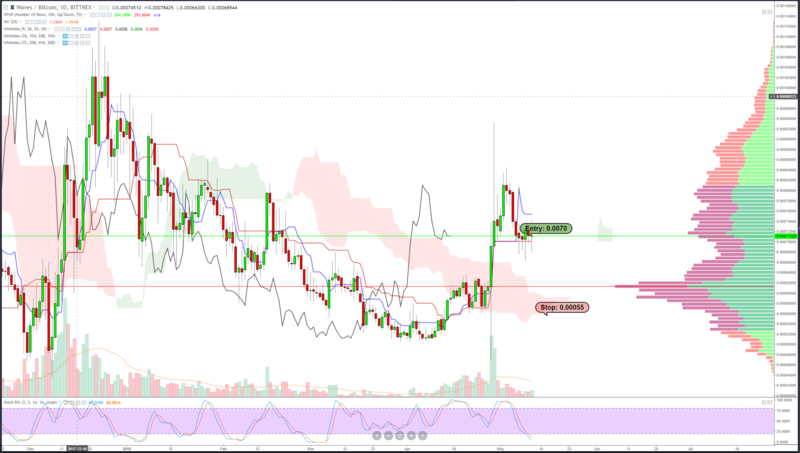 It’s rare because WAVES’s daily chart meets all conditions for going long based on the Ichimoku system. One of the few crypto-charts that has appropriate volume, participation and all long conditions being met is WAVES. Price is above the cloud, the lagging span is above the cloud, the cloud ahead is green and the conversion line is greater than the baseline. Even better, the last 4 daily candlesticks show the baseline is holding as a firm support level. A long entry at the current value area is a very appropriate entry. 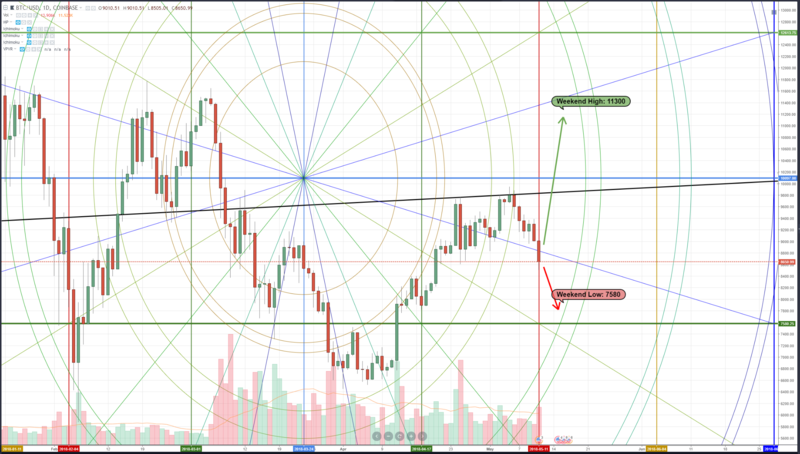 Gann’s market geometry and his Law of Vibration show us an interesting condition on Bitcoins chart. The red vertical line is a pivot in time. Price has a strong probability of reacting the same way to the previous pivot in time in this cycle, the first pivot being on February 4th, which resulted in a strong bounce from a down move. We have a very similar setup on the current chart: down move prior to the pivot. Additionally, the move itself is also followed. This is interesting because the swing from the February 4th pivot was a 100% gain from swing low to swing high (5873 to 11775). A 100% move from this current zone would put us well above the 15000 value area. That level is within the parameters and behavior of Gann’s work, but it seems to be a bit excessive of a drive, a more conservative approach would be the 10800 – 11300 value area.